"Your One Stop Internet Home For Inexpensive 8-Tracks and Much More!" Celebrating 20+ years in business!!!! 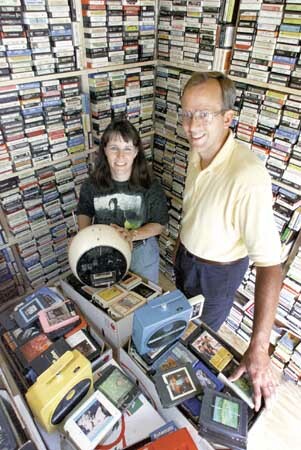 Dan & Kathy Gibson - Just a small portion of the "Shack"
Spring is here and so are 8-tracks my dear! Sorry, just trying to be funny! Spring cleaning time so get those 8-tracks out, crank up the tunes and start cleaning! Just a reminder that postage just went up again! Some services went up just a little and some went up a lot! 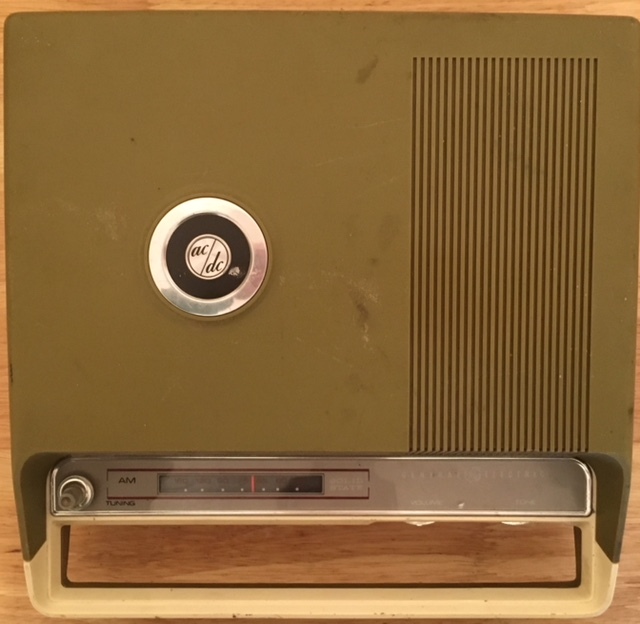 Have a cool little record player for sale. It's not really 8-track related, but it is vintage! It plays 45's, 33 1/3 & 78's and has AM radio. It's not a high end player, but it's a fun little player! You can see more pics on our Portable Players page. Sarah Vista - Killing Fever - https://www.sarahvista.com/product-page/killing-fever-album-8-track-tape (I think they are out of stock but having us make more up) Contact them to let them know you'd like to get one. The Dirty Nil - https://www.dinealonestore.com/collections/the-dirty-nil/8-track (I think these are sold out as well, but should be more shortly). Just contact them to let them know you'd like to get one. Working on a few others. Will let you know when they're up for sale. We've stated this many times and it's on our website in multiple places, please make sure the shipping info. you have on PayPal is correct when using this form of payment!!! We can not stress this enough. If you've recently moved or moved some time ago, please make the change to your PayPal account. If your package is miss delivered or returned to us because you haven't made the change or given us the correct shipping address (don't assume that because it's on your package we will use that one because we get packages all the time that have been shipped from a third party with their shipping info. ), you will be responsible for any extra charges to get the package to you. Christmas is just around the corner! If you're thinking about having your 8-track tapes (audio) or VHS tapes (video) transferred to CD/DVD as gifts for Christmas, now is the time to get them to us! We have a lot going on in the months before Christmas. We also close down just before Christmas to be with family so any last minute transfers will incure rush convenience fee. We are changing up our page with the tapes we have for sale. We have eleminated some of the lists and combined them into one list. Some of the list categories are still there. Some of the prices have been lowered. On "The List" we will be putting up 300-400+ tapes every couple of weeks. When the next list goes up, those tapes that haven't sold, will come off and a new list of 300-400+ tapes will go up. The ones that didn't sell may or may not come back up for sale again so if you see something grab it while you can! The Christmas tapes are back on the list temporarily. With Christmas just around the corner, time to get those tunes started! When sending tapes or players for repair/tune up please do not use household items, clothing, diapers, etc. to pack with! Bubble wrap, newspaper, foam, etc. work great! NO packing peanuts! They can get stuck in your tape or player and cause more damage (not to mention a pain to deal with!). If you're sending a player in for repair/tune-up, be sure to pack it well!!!! Pack it as if it were an egg that might be broken. Lots and lots of large bubble wrap. If it has removeable knobs, remove them or cover them so that they won't be broken if the box is handled by a gorilla! Put insurance on the package. If you're not sure how much to put on, put at least $100. We can't be responsible for poorly packaged items! For those of you who may be having problems connecting to our email address when you click on the " email us" or "contact us" links, you can use sales@katestrackshack.com to email us. We will be giving up our home phone within the next month. The best way to contact us is through email. If you do need to reach us, you may call 817-789-6881. If we can't get to the phone, it will go to voicemail. Leave us a message and we'll return your call as quickly as we can. Thanks! We also are making some cool 8-track adapter/converters that you can use to play your music from your iPod, iPhone, etc. Very cool!!! Every player is different so run it through the channels until you get the best sound from your adapter. In talking with one of our customers, he had mentioned that he has a friend that owns an AM radio station and had mentioned us on air to his dj friend. The station is all digital (we won't hold that against them ;) ) but it's pretty cool! The station is www.i1430.com and their facebook official page is www.facebook.com/i1430. Be sure to check them out! We'd also like to remind you that although we are mainly an internet business, we do have hours that we operate our business - 9-5, M-F CST . We love talking with you on the phone, but durning business hours only please. If you need to pick something up or drop something off, give us a call (817-789-6881) during business hours and we'll work something out. Thanks for your understanding! We've had quite a few orders that have not been paid for. We understand things happen and we're willing to work with you, but if you're not able to pay for your order, please let us know so that we can put the tapes back on the list so others have the opportunity to buy them. Thanks! We are on Facebook! If you are too, please join us! As a reminder, we require delivery confirmation on all US packages. Most International packages usually have some sort of tracking number. This is for your benefit as well as ours. Insurance is optional. We can't be responsible for packages that are lost, stolen or damaged in shipping unless the package is insured. It is highly recommended on larger packages that might tend to get damaged in shipping. If your package is insured and something happens, we will be more than happy to work with you and the post office to rectify the situation. Just need to make a clarification on the tapes we sell. The tapes that we put on the list, unless otherwise stated, are tested to make sure that they play, but have not been tuned-up (new pads/splices). These tapes can be tuned-up before they ship for an additional $2 per tape. For those that like to do their own repairs, we also sell the repair supplies needed to to that. When you place your order for tapes, if you want the tapes tuned-up before they ship, please let us know. We try to ask, but sometimes we forget. Just a friendly reminder that we are mainly an internet business and don't have a physical storefront per say. We try to answer all emails as quickly as possible but if we don't, we promise we will! We may just be doing things with our family. Weekends are especially busy for us so don't abandon hope that we aren't getting back to you. Don't forget to check out our players, they're going fast! Click here for info. on how to be notified when a new list or other info. is available. We have lots of accessories and repair supplies to keep those 8-tracks, 4-tracks, etc. going for a long time to come. If you don't like to repair your own tapes, we offer that service. If your car has an 8-track player you need to have one of our cool license plate frames! You can see what they look like on our accessories page (down at the bottom of the page). If you are paying with PayPal, please make sure that the address you have on file with them is the correct address. If you've moved and haven't changed it or haven't given us your correct address, your package could be delayed. If it is sent back to us because of an incorrect address, there will be a charge for the return shipping from the post office as well as the original shipping costs. Just a reminder! Each order must be paid for separately! Also, if you place an order for tapes and then decide you don't want them, please let us know so we can put them back on the list. There may be someone else wanting the tapes you don't want. We will be glad to try and fill special orders or search for tapes for you, but there will be an additional charge added for this service. Also, please be patient as there are thousands of tapes to look through and we get tapes in all the time! We now accept credit/debit cards as well as PayPal, checks, money orders & Zelle. Please see our ordering info. page for more information. Please see How To Order for further options. You may now pay using Quick Pay or Zelle. Funds are sent electronically at no charge. Gift Certificates make great gift for those hard to find for friends/loved ones. Who doesn't enjoy getting a gift anytime of the year! For those who like to fix their own 8-track tapes, we offer several fix-it yourself kits. We're looking for 8 track molds (not the plastic shells, but molds used to make them) or other 8-track related equipment. If you have anything or know of anyone that does, please email us. Thanks! 8tracks radio is a free player from Google Play, Apple's App Store and the Window Store. Whatever your music tastes, you can find it here. Click on the icon below to take go to their web page. Login or sign up and then do a search for k8track. When you get to our mix page, go down on the left side and click on the logo under "Mixes by k8track." Enjoy listening to some of the songs we enjoy on 8-track while you're browsing the web site. 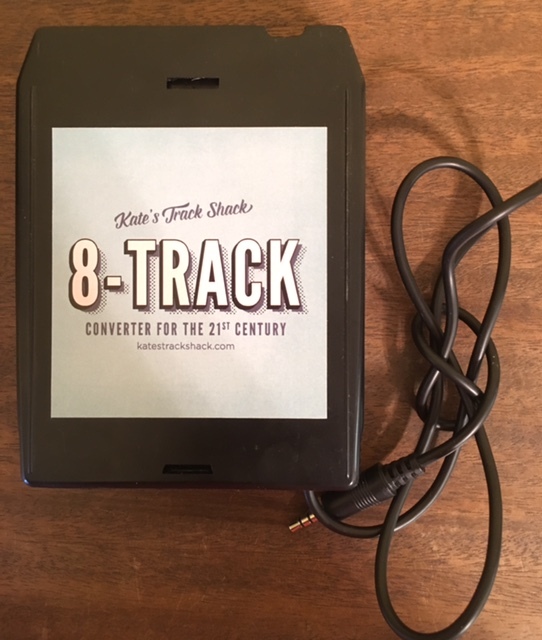 To go back to the web site, click on the "by k8track" (for some reason the link for Kate's Track Shack doesn't seem to work) in the bottom right corner. You can then see the web link at the top left. Let us know what you think. Eight Track Stereo by Blue Boxen, LLC is a very cool player for the iPhone or iPad! It looks like an 8-track player and your music looks like an 8-track cart. I think it costs something like $4.99, but well worth it just for the cool factor! It's not available for Androids.